Reverberations | Losing My Religion? In March 2014, I took my journalism class to India to cover the role of religion in the upcoming election. I’d done similar trips before to Israel and Ireland, but this time I wanted the students to have more than a fleeting encounter with the religion they were covering. The best option, I decided, was a long weekend at an ashram, where students could meditate, practice yoga, and listen to spiritual masters. The key was to take them outside of their comfort zones and into silence and stillness, trusting they would experience something visceral and perhaps even essential. I chose Ananda and Osho because they were both Westerner-friendly and close to Mumbai, where we would do our reporting. So, after flying twenty-plus hours from Los Angeles to Bombay and driving another six hours to Pune, I’d dropped half of the students at the rural Ananda retreat and alighted at Osho, an in-town urban oasis, with the rest. I gave clear instructions to both groups: try to stay off your screens and experience rather than observe (no taking notes). I also explained that they would be expected to write a first-person account of their visits, but that these could be anything from a chronicle of their spiritual journey to a review of the ashram’s food. 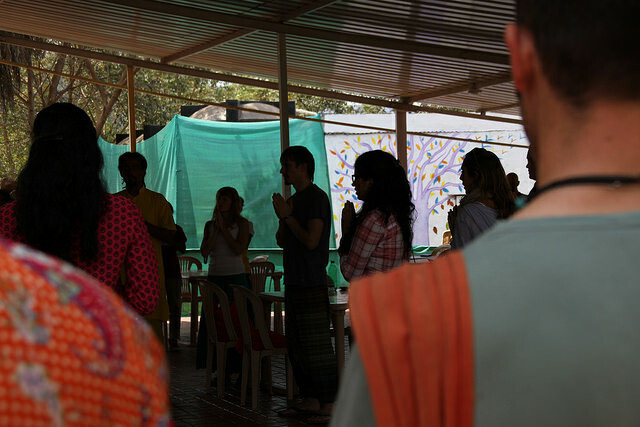 Below is a collection of some of the students’ reflections on experience at the ashrams. All of the students have graduated since writing these pieces. Diane Winston, Knight Chair in Media and Religion at the University of Southern California, is on the advisory committee for New Directions in the Study of Prayer. A veteran of yoga and meditation practices, she looked forward to her time at Osho as an idyllic retreat. Grace Lim, a graduate student in journalism, comes from a deeply religious family. The weekend at Osho reinforced her Christian identity, spurring her to re-think the importance of sharing her faith with others. Rosalie Murphy, a senior majoring in journalism and history, went to Osho. A practicing Catholic, Rosie was unsettled by the experience of dynamic meditation, and the ensuing spiritual crisis peeled back a layer of her defenses. Chhaya Nene, a graduate student in journalism, had family in Pune and Mumbai, but none had visited Osho, where she spent the weekend. Although Osho’s teachings have a basis in Hinduism, Chhaya did not think what she heard there squared with what she knew about her tradition. Katherine Davis Young, a graduate student in journalism, was a yoga instructor before coming to journalism school. Her time at Osho helped her see how she had changed, and why she missed some of what she’d left behind.